As the opening words of this article clearly show, there is momentum in the field of CSS. The major browsers out there are still working hard to implement CSS features, and the passionate developer community is working hard to continue making great websites with CSS. Think of the innumerable blogging sties using WordPress which of course uses CSS to complement theming. With a strong foundation and active community, CSS is very relevant today. Impact: Writing last decade's HTML can result in over complicated markup that will behave inconsistently across multiple browsers. How to avoid: Stop using <table> element for layout of content, and limit usage for it to displaying tabular data. Get acquainted with the current markup options available such as seen at https://html.spec.whatwg.org/multipage/semantics.html#semantics. Use HTML to describe what the content is, not how it will be displayed. To display your content correctly, use CSS (http://www.w3.org/Style/CSS/). 2 ) "It works in my browser…"
Mistake: A developer may be fond of a particular browser or really despise one, and might primarily test web pages with that bias in view. It is also possible that code samples found online may be written without factoring how it would render in other browsers. Also, some browsers have different default values for styles. How to avoid: It would not be practical to test web pages in every browser & version during development. However, having a regular interval of checking how your site will appear in multiple browsers is a good approach. Sites such as http://browsershots.org/ show snapshots of how a given page would render over multiple browsers/versions/platforms. Tools such as Visual Studio (https://www.visualstudio.com/en-us/visual-studio-homepage-vs.aspx) can also invoke multiple browsers to display a single page you are working on. When designing with CSS, consider "resetting" all the defaults as shown at http://meyerweb.com/eric/tools/css/reset/. While the above references explain a movement away from vendor prefixes and why, this site http://davidwalsh.name/goodbye-vendor-prefixes provides practical suggestions on how to work through this today. Impact: Many things can (and likely will) go wrong when user entry is trusted. Pages may fail if required data is not provided, or data received is not compatible with an underlying data scheme. Even more serious is the intentional violation of the site's database, perhaps through Injection attacks (see https://www.owasp.org/index.php/Top_10_2013-A1-Injection). Ask yourself: "Are all my graphics absolutely necessary?" If not, remove unneeded images. Minimize the file size of your images with tools such as Shrink O'Matic http://toki-woki.net/p/Shrink-O-Matic/ or RIOT http://luci.criosweb.ro/riot/. Impact: As new versions of browsers update, management of code files become bulky and difficult to manage. How to avoid: Implement feature detection in code versus browser/version detection. Feature detection techniques not only dramatically reduce the amount of code, it is much easier to read and manage. Consider using a library such as Modernizr (http://modernizr.com/) which not only helps with feature detection, it also automatically helps provide fallback support for older browsers not up to speed with HTML5 or CSS3. How to avoid: Think responsively. Use responsive design (see http://en.wikipedia.org/wiki/Responsive_web_design) in your sites. A very popular library ready to serve in this area is Bootstrap (http://getbootstrap.com/). How to avoid: Use SEO (search engine optimizations) and support accessibility in HTML. Regarding SEO, be sure to add <meta> tags to provide meaning to a page with keywords and description. A good write up on that is found at http://webdesign.about.com/od/seo/a/keywords-html.htm. To enable a better accessibility experience, be determined to provide an alt="your image description" attribute in each of your <img> or <area> tags. Of course, there is more to do and further suggestions can be investigated at http://webdesign.about.com/od/accessibility/a/aa110397.htm. You can also test a public web page at http://www.cynthiasays.comCythiaSays.com to see if it is compliant with Section 508 (http://www.section508.gov/). How to avoid: Explore your options. Consider using new tools or new process techniques for every stage of development. For example, how does your current code editor compare to Sublime Text (http://www.sublimetext.com/) or Visual Studio (https://www.visualstudio.com/en-us/visual-studio-homepage-vs.aspx)? Regardless of what code editor you are using, have you recently dived into its features? Perhaps a small investment of your time perusing the documentation could unveil a new way to do something that could save hours & hours of time later. 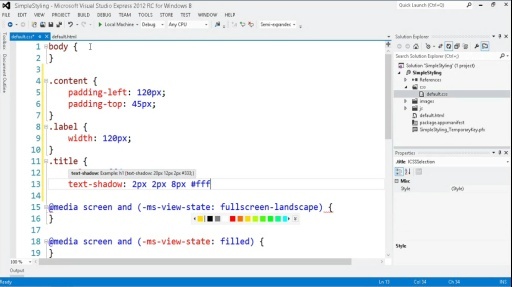 For example, note how an extension to Visual Studio can increase productivity for web developers as seen in this post http://www.palermo4.com/post/WebCamp-Essentials.aspx. Don't miss out on tools available on the web to help! For example, check out the tools at http://dev.modern.ie/tools/ to simplify testing (across multiple platforms and devices) and troubleshooting. You can also help reduce time and mistakes by automating processes. An example of this is using a tool like Grunt (http://gruntjs.com/) that can automate things such as the minifying of files (see mistake #4). Another example is Bower (http://bower.io/) which can help manage libraries/frameworks (see mistake #9). How about the web server itself? With the help of services such as Microsoft Azure Web Apps (http://azure.microsoft.com/en-us/services/app-service/web/), you can quickly create a site for virtually any development scenario that can easily scale with your business! First point of interest is a new template type named “Hub App” which allows for a hierarchical system of navigation. The template uses a new Hub control, and you can learn more about it if you download the Hub control sample. Regardless of which template type used though, let’s examine some core changes. Here is the code to make it all work! To reproduce in your own environment, simply replace the images with your own! In no way am I claiming this to be original. But I can’t say I have seen this trick done anywhere else. With the CSS :hover selector, you can create a nice “status message” appear in one location while hovering over particular items in a list (or menu). Below are the screen captures of what the trick accomplishes, followed by the entire source code to make it possible. Enjoy!